The Security Council decided to establish under its authority a United Nations Operation in Somalia (UNOSOM). The council did so by adopting resolution 751 (1992) on 24 April 1992. The mission's objective is to facilitate an immediate cease-fire throughout the country, in order to promote the process of reconciliation and political settlement in Somalia and provide urgently needed humanitarian assistance. 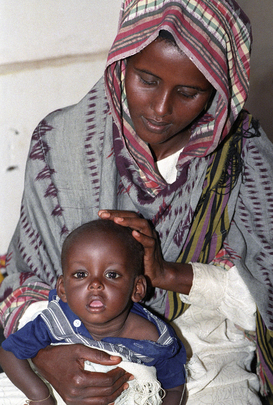 A Somali mother sits with her child while waiting for food at a UNICEF/Swede Relief feeding centre in Shirei, Somalia.